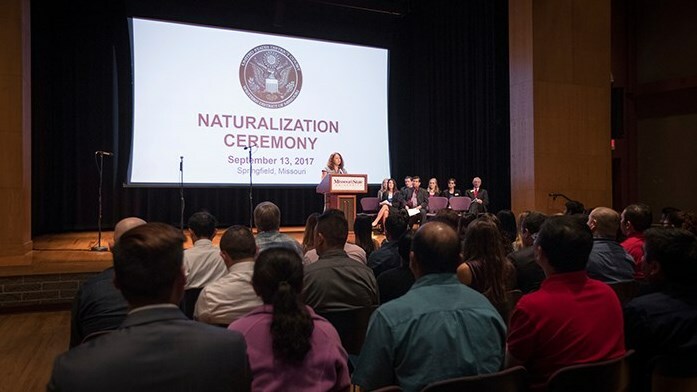 Witness as those in the Western District of Missouri take their Oath of Allegiance and thereby complete the process of becoming a U.S. citizen. There will be a variety of speakers along with MSU's vocal talent performing the National Anthem and America the Beautiful. Attendees of the ceremony should park on John Q. Hammons Parkway, between Harrison St./Cherry St. This parking lot is located across the street from the First & Calvary Church located on the MSU campus. Volunteers will be stationed at the parking lot to assist. A free designated ceremony shuttle is provided from 9:30 a.m.-1 p.m. to transport guests to and from the parking lot to the ceremony location at the Robert W. Plaster Student Union. Shuttles are fully accessible for those with impaired mobility. The actual ceremony will take place in the Plaster Student Union (PSU) Theater. Please view directional signage upon entering the PSU for check-in room locations and family hospitality room. A section of the PSU Theater will be reserved for applicant families/guests. Printable parking map/directions for applicants and guests of the ceremony.